At last author Elsa Hart’s clever 18th century, Chinese detective, Li Du, has wended his way back to his home city of Beijing after many years in exile. The Emperor — who had sent him away because of his association with a man accused of treason — pardoned him because of the the service Li Du rendered in “Jade Dragon Mountain,” the first book in Hart’s addictive series. Now Li Du must solve the “crime,” if one exists, that sent him into exile. It is Li’s belief that his mentor, Shu, had not been a traitor, even though he had admitted to the crime of treason. We have followed Li Du’s path from exile and redemption in a remote city of the Chinese empire to ruminations in a blizzard in a remote valley in the first two books. Because of those ruminations and a clue dropped by a fellow traveler hinting at Shu’s innocence, Li Du has returned to Beijing. “City of Ink” picks up Li Du’s story two years after his return. He is the assistant to the administrator of a small section of the Outer City, a position far beneath his original posting as a librarian in the imperial library of the Inner City. But it is this lowly clerkship that is more useful in obtaining the information he needs to vindicate his former master. Because this is a mystery series, eventually there is a murder. The Black Tile Factory, which manufactures roof tiles, is the scene of the crimes, plural, since two bodies have been found. Because the factory is within the purview of Li Du’s borough, he accompanies his boss to view the scene. Eventually he works with Chief Inspector Sun to discover who might have murdered Mrs. Hong, the wife of the tile company owner, and Pan Yongfa of the Ministry of Rites. Had they been meeting romantically and were they then discovered by Mrs. Hong’s husband, the inebriated and confused Hong Wenbin? Was he capable of murdering them? Of course, Li Du realizes there are some anomalies at the crime scene. And he’s off. The pressure to solve the tile factory crime interferes with Li Du’s investigation of the culpability of his old master, but he manages to spread himself all over both the Inner and Outer Cities. He even briefly joins forces with the strong and intelligent mistress, Lady Chen, of his snobbishly superior cousin, a woman he met in the first book. In this latest adventure, Li Du also reunites with Hamza, a storyteller he met in the first book whose help has been invaluable in solving the crimes that have littered Li Du’s winding path. 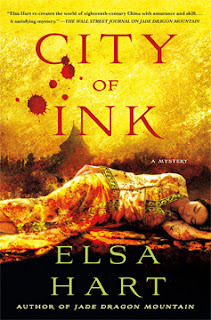 Elsa Hart writes in a compelling way very few others can; she combines history with a quiet and confident good story. She does not sacrifice setting a scene in order to barrel into action. She lays her story down in a deliberate and enticing manner. Li Du’s contemplative manner is attractive instead of boring. There are also little pleasant surprises to go with the big reveal-all ones. I have been so satisfied with all three books that I have read them one after the other, something I rarely do. This is a heartfelt MBTB star award, not just for this 2018 title, but for the entire series, the start of which I missed a few years ago. I am attempting to remedy that omission now.